Our school district shifted to a full week off for Thanksgiving this year. That squeezed my students’ time to cover the material we must complete before the final exam in a few weeks, but it did provide the opportunity for a mini-vacation ahead of Thanksgiving dinner with my folks. 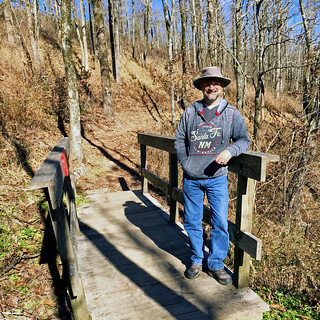 Wendy and I chose to spend a couple of days at the recently re-opened Queen Wilhelmina Lodge on the eastern end of the Talimena Skyline Drive. We would be staying in the third revision of the third lodge built on this site atop Rich Mountain. The first lodge was built in 1898 by the Kansas City, Pittsburg and Gulf Railroad. It was named after Queen Wilhelmina of the Netherlands, reflecting how the railroad’s major investors were from Holland. The railroad went into receivership the next year and was sold to become the Kansas City Southern, which still operates the rail line in the valley on the north side of Rich Mountain. The railroad gave up the newly built inn, which operated under different owners until closing in 1910. It fell into ruin, only briefly and partially resurrected in the early 1940s to house a summer music school. 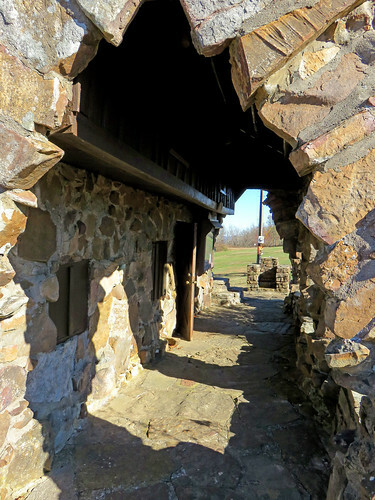 In 1957 the site became part of the new Queen Wilhelmina State Park, and the state slowly rebuilt the lodge, using some of the original remaining stonework. The new lodge was completed in 1963 and operated until it burned in 1973. The lodge was rebuilt in 1975, remodeled to some extent in 1981, and that aging structure was the one I stayed in when I hiked the trails there in January 2011. I can recall how there was no elevator serving the second floor where my room was located, the room was small and old, while the dining room was quite pleasant. 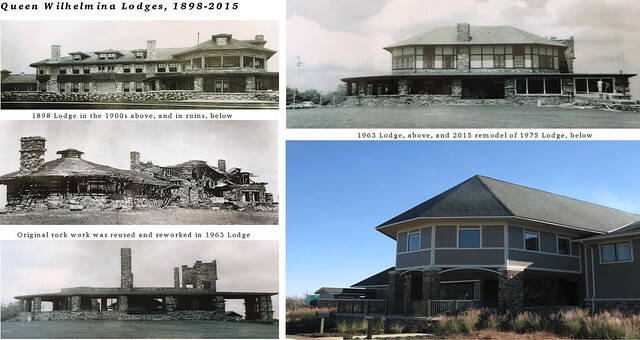 The lodge closed in February 2012 and did not re-open until June 2015 after a $9.6 million renovation and expansion. The project was troubled, with long delays and a change in contractors, but the lodge now has an elevator, much larger windows, insulated walls, and grew from 26,300 to 36,500 square feet to expand both the size and number of the guest rooms, add on a new public hearth room and upstairs meeting room on the south side, and remodel the lobby, gift shop, public restrooms, and registration desk. The cost of the project increased to allow for a full re-working of the kitchen as well. But the old high stone chimneys are gone, even though there was a fire of real logs always burning in the hearth room’s new fireplace. For several years I’d been checking repeatedly online to see if the lodge had re-opened, wondering why it was taking years to complete the renovations. Wendy and I enjoyed our stay at beautiful Mount Magazine in June, atop the highest peak in Arkansas. So, when I found the lodge atop the second-highest peak in the state had finally re-opened, we decided that would be our retreat for the start of our break. Having stayed at both concessions, our conclusion is that we’d rather return to Mount Magazine for a future stay, since its spacious and sumptuous lodge is better situated for a dramatic view of the valley below, and its park features more interesting trails. But we still enjoyed our stay atop Rich Mountain. Our journey began on a Sunday morning, timed so that we could have lunch at the Mazzio’s in Poteau and still arrive at Queen Wilhelmina State Park in time for a tour of its Wonder House, which is located near the lodge. 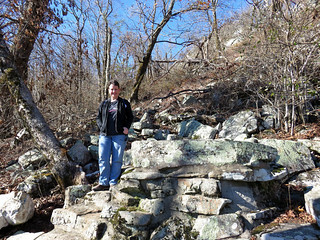 Our spirits lifted along with our car as we climbed the Ouachitas. Having grown up in the flat cross timbers of northwest Oklahoma City and spent many a youthful vacation in a family cabin in the Ozarks, venturing into the mountains always cheers me up. Fittingly, we noted a Kansas City Southern train carrying a large load of coal through the valley below Rich Mountain as we approached our destination; the mountaintop legacy from that rail venture lives on. We arrived in time for the tour of the Wonder House, a weird combination of two small rock buildings built in the Great Depression by Carlos Hill. He drove up Rich Mountain on a Harley Davidson motorcycle in the early 1930s, living in the area to study at Commonwealth College. He married a local girl, Mary Lance, and they lived on the mountain in a home just east of what would become the Wonder House. Carlos built the first part of the Wonder House as a small rustic cottage for sale. He sold it to oil man C.E. Foster from Muskogee, who paid Carlos and his brother-in-law Phil Lance to add the second structure, which was subdivided into different levels for bedrooms, kitchen, bath, and so forth. The weird structures acquired the Wonder House moniker when they became a souvenir shop in the 1960s. I’d pondered these sealed-up oddities on my first visit to the park in 2011, wondering what the interiors might look like, given the signage proclaiming that together they housed nine levels, a 21-foot-long bed, and ice-free stairs. Melissa, our tour guide, opened the front building up and let us look around its single room, which had displays about the park and its history. She told us how the exterior stairs to the attic bedroom wrap around the chimney, helping to keep them free of ice in the winter. But our group was not allowed to venture to the cramped upstairs to ponder the 21-foot-long bed where three children once slept head-to-toe. Only children could find that prospect enticing. Eventually our guide let us into the second building, but I found it quite underwhelming. Its various levels were tiny and built of cheap wood. No one wanted to spend too much time inside, finding the stone work on the exterior of the building and its multitude of windows more interesting. Later I found the property’s documentation for the National Register of Historic Places, which told me that there were once narrow openings between the various levels to allow occupants to pass items from one to another, and there was once an interior ladder in the first building for its bedroom attic. Given the bizarre design and limited functionality of the buildings, I’m not surprised that only one other of Carlos Hill’s houses survives. Melissa said it sits east of the lodge in the employee area and is in need of repairs. Wendy and I walked around the area, finding remains of stone walls down the hill east of the house, their purpose unknown. Wendy noticed some intriguing frost flowers on some plant stems along our path, and examined the layering of the frost crystal sheets. We drove over to the nearby lodge and relaxed in its spacious hearth room, which has many different tables and settings for small groups of visitors. I enjoyed perusing a binder with photos and articles about the park’s early history and bought a booklet about history of Rich Mountain authored by Bradley H. Holleman. We checked into our room, which had large windows along with a spacious shower in the bathroom. The WiFi had improved since my stay in 2011, with multiple access points along the corridor ceiling, but the internet service was still rather slow. Anything we could get was welcome, however, since cellular service in our room was weak and intermittent. Wendy was not thrilled by the room’s Keurig coffee maker, and she’d forgotten to pack the old portable coffee pot my father had given her. So we drove down the mountainside into Mena to buy a cheap coffee maker at the Wal-Mart Supercenter and enjoyed a good dinner at The Branding Iron, topping off our chicken fried chicken entrees with some chocolate cream pie. We had a late breakfast in the lodge cafe the next day. While the breakfast buffet did have traditional cooked items and was better than some hotel breakfasts I’ve suffered through in recent months, we decided we would order off the breakfast menu the following day so that we could enjoy hot and fresh food. Once the weather warmed sufficiently, with the nippy wind of the day before having died down, we set out on the Lover’s Leap trail for a 1.1 mile loop around the east end of the summit. This summer I bought a hoodie in Santa Fe, and the chilly weather finally made it feasible for me to wear it on our hike. That prompted a fellow hiker to remark, “Beautiful city!” Wendy would certainly agree, adding, “Great green chile!” I’m excited that we’ll have our summer honeymoon in the Pacific Northwest, but I’m certain that we’ll spend many summer vacations in Santa Fe. The trail led down the mountainside from the lodge. Through the trees, I could glimpse rainbow hues across the forested valley below. Oranges and red in nearby deciduous trees gave way to green pines and then to the hazy blue mountains beyond. I eagerly sought a clear view for my camera. We admired the stone work of the 1996 trail crew, which forded one of the rock glaciers which moves as a mass instead of rock over rock, preventing the growth of vegetation. Wendy posed for me, and then we climbed our way up and around to the stony projection of Lover’s Leap. The platform there provided a sweeping view of the Rainbow Forest below. We then made our way back up to the lodge, with Wendy noticing the spiny red stems of the brambles surrounding us. Up top, the Southern Belle miniature train passed by, its passengers waving at us as they made their way along its 1.5 mile loop. The little train on its 16-gauge tracks has been a part of the park since 1960. Wendy and I had dinner at the lodge, with me enjoying my cheeseburger, augmented by some of the bacon off Wendy’s chicken sandwich. Then we retired to our room, where I hooked up the big flatscreen monitor to the DVD player I’d brought with me so that we could watch Hitchcock’s Family Plot. The next morning, we enjoyed pancakes and French toast with bacon in the lodge cafe, checked out of our room, and headed home. 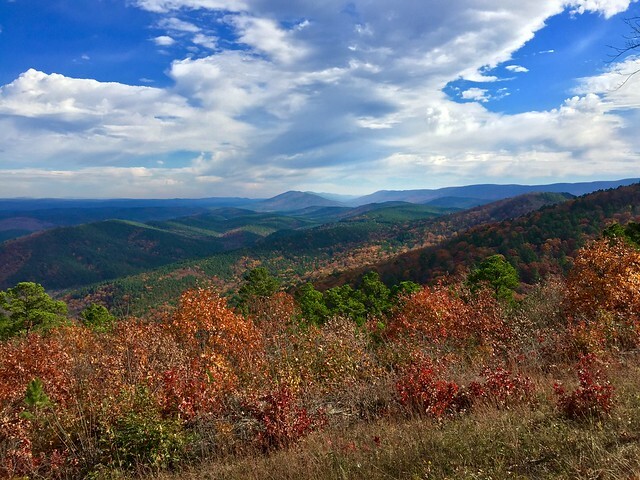 We wondered what autumn colors might be left along the Talimena Skyline Drive, or Talimena Scenic Byway as it is called these days. It stretches for 54 miles along the crest of Rich Mountain westward from Mena, AR on into Oklahoma before ducking over to follow the crest of Winding Stair Mountain on westward, following old truck roads built by the CCC in the 1930s. I’ve driven the route many times over the past 30 years, with fall being my favorite time of year to brave the winding path. Sometimes the route is dangerously foggy as clouds descend to shroud the mountain tops, but this day was bright and sunny, although quite hazy to the south. The haze meant our best views were to the west and north, with autumnal hues mixing with the green pines and blue hills. Emerald Vista was particularly beautiful on this trip. Wendy and I picked out different views of the same tree in the foreground of our respective shots. I enjoyed signage which noted how the land below had once been so thoroughly deforested by lumber companies that it was sold off to the government as nearly worthless; now that reforested land is a treasure for the eyes, reminding us how a long-term investment in conservation and restoration can re-create what has been destroyed. I decided to take an unfamiliar route from the western end of the drive. Instead of heading northeast back toward Poteau, I steered southwest through Talihina, where we laughed at the name of Pam’s Hateful Hussy Diner. We then took Highway 82 north across Winding Stair Mountain to Red Oak. The route was scenic, but the road as winding and difficult as I would expect. Red Oak had an odd purple color scheme on its public works, which Wendy figured out reflected its school colors. Then we were surprised by the 13 mile stretch of highway 82 leading north from Red Oak across the Sans Bois mountains, east of Robbers Cave, up to Lequire. This section was wide, with multiple lanes and sweeping curves on massive amounts of fill. This unusually modern section of road was not built until the 1990s and is a beautiful drive that seems to belong in another state instead of Oklahoma, with its notoriously poor roads. I don’t know if that highway brought the economic development its promoters hoped, but we certainly appreciated it. We enjoyed a delicious early dinner at the Oliveto Italian Bistro in south Tulsa and then made our way home. The trip was a blessing, and I give thanks this week for the mountains of southeast Oklahoma and western Arkansas, as well as for the lady I get to share them with.